In this age of polymers and plastics, knowing which products are best for your gun can be tricky. 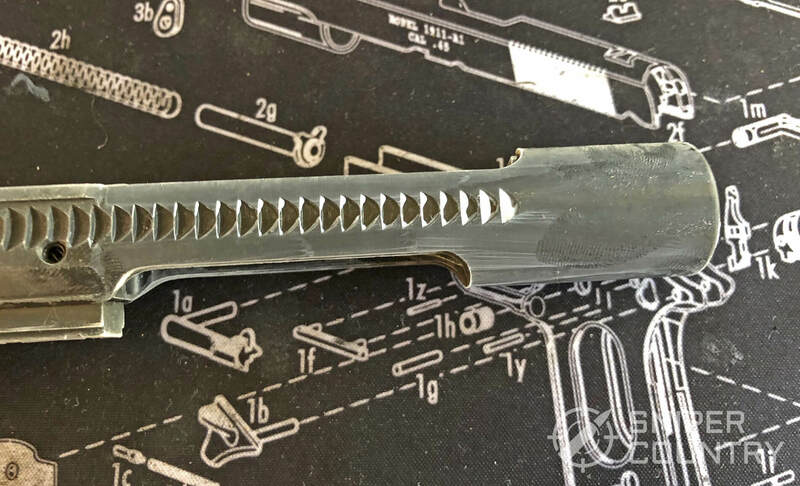 No one wants their new gun’s internals to be eaten by an overly aggressive olde tyme solvent, and with the advances in oil technology we have today, it doesn’t hurt to take a quick look around. Even Uncle Sam has decided it’s time for an eco-friendly upgrade, which got us thinking, what is in all these oils and greases, what makes a gun oil superior to a regular oil, and what should we be running in our guns right now? So, we decided to do a test. 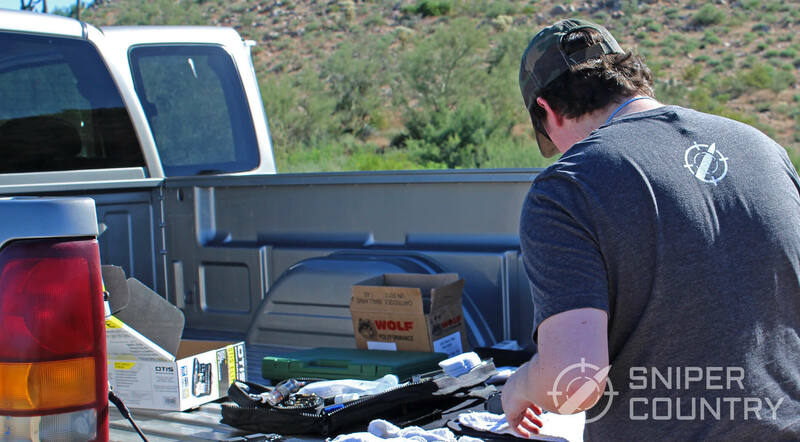 Using a brand new Ruger AR-15 and the same ammo (Wolf Polyformance) for each test, we fired 1600 rounds using each lubricant (200 per product) and inspected the results. Fortunately for me, lubricant testing falls under the multi-purpose umbrella. We picked an assortment of the most popular gun lubes used today, both old and new, along with a few popular non-gun specific lubricants. Other factors, like the climate the gun would be used in, and what the gun would be used for, were kept in mind too. People like me who live in the desert care about a lubricant drying out, and how much dust it will attract, while those in oceanic areas are more concerned with humidity and salt causing rust. A temperature test was also conducted to see how well the thicker lubes would fare in freezing conditions. In order to get a good mix, we choose three CLPs, three typical lubricants, and two gun greases. Why use a “gun lubricant” over an automotive or machine lubricant? Mineral oil has been used to lubricate machines for over 200 years. In many ways, oil is what kept the wheels of progress turning. As machines became more advanced, the requirements of the oils that lubricated them increased too. Synthetic oil was created by heavily refining mineral oil, and additives were invented that improved things like shear resistance. It is no surprise then, that people would assume an oil advanced enough to keep their car running would keep their gun running too. And it will. But, there are better choices available. Staying within the realm of firearms, lubricants are primarily subjected to heat, shearing forces, powder residue and carbon deposits. A typical motor oil is designed to handle all but one of those conditions, so it does have a few things going for it. It will attract and collect carbon deposits though, which can clump up in your gun. If you use dirtier ammo you’ll need to clean your guns more often. It also doesn’t leave much of a corrosion resistant film, so it needs to stay layered on the gun for long term protection. 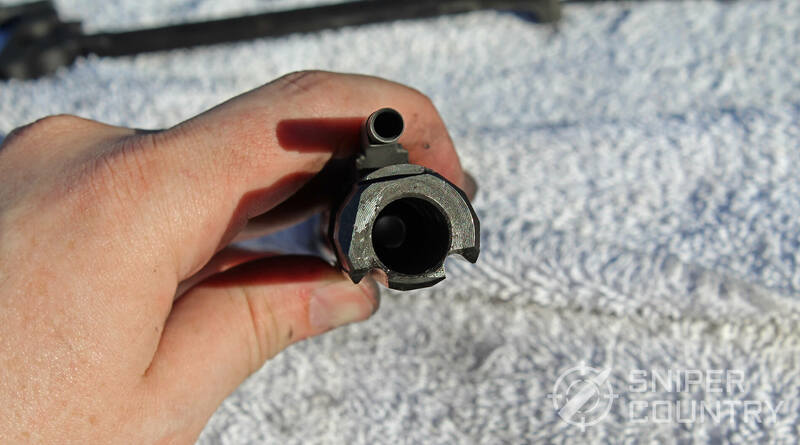 There are other non “gun” lubricants that can do a better job, like LPS. The real danger is from chlorinated paraffin and esters, which are used in some older gun lubricants (none of which are on our test list) and more commonly in high pressure machine oils. They will eat through polymer frames and can lead to metal corrosion. Chlorine compound additives were removed from engine oils several decades ago, but you can still find them in local auto parts stores as aftermarket additives. As long as you don’t add them, you should be able to use motor oil as a gun lubricant without harming your gun. Discussions about the best gun lubricants often involve a debate between oil and grease. Oil and grease are the same on a basic level, the difference is what’s added to it. Grease is oil with a thickening agent applied. Choosing one over the other is based heavily on application and operating conditions. In general, oil is great at lubricating parts with tight tolerances and for reaching places that grease may be too thick to get to. Since it’s thinner, it takes more contaminants to gum it up, and is usually easier to wipe off and reapply. 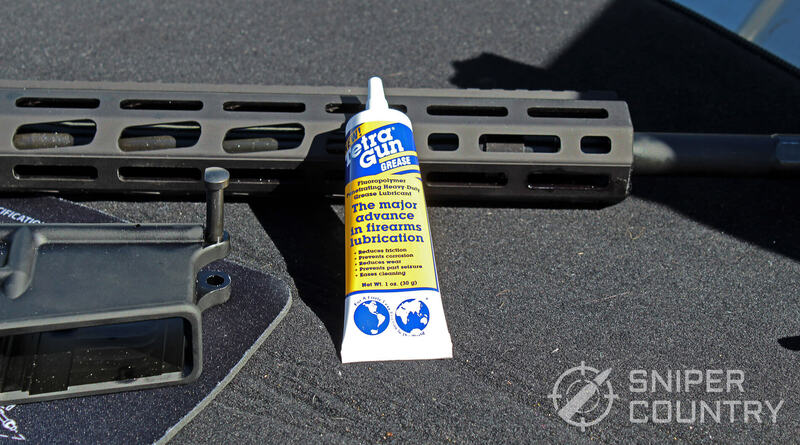 Most modern gun oils contain additives that leave a thin non-stick film on the surface it was applied to, even after drying up. That can protect the surface and make it easier to clean in the future. Oil’s thinner nature can be a detriment though. It can cause it to run off of the surface it was applied to, or drip down into hard to reach places. In arid climates, lighter oils tend to evaporate noticeably quick and require more frequent applications. Greases usually have additives that provide corrosion protection too, and their thicker nature can help them maintain protection for longer. Most modern greases use an organic thickener like lithium soap, which is where products like White Lithium get their name. In addition to increasing viscosity, lithium soap improves the grease’s ability to adhere to metal. As a result, less needs to be used for the same lubricating effect and a thinner film of grease will collect fewer contaminants. The drawback of grease is its propensity to harden. 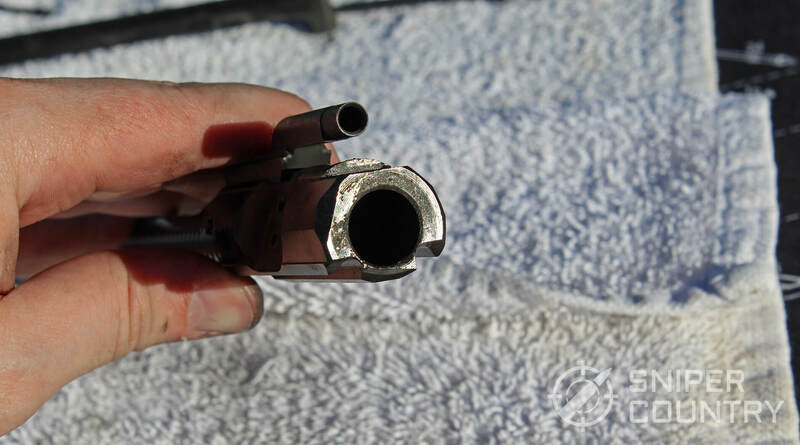 In cold climates some greases can slow down a gun’s action enough to make it fail to cycle and if left open to air, it will eventually dry out and stiffen. How long that takes is dependent on the grease. Many oils available today will tout the all-in-one trifecta of cleaning, lubricating and protecting. The CLP concept has existed for a long time, at least as far back as 1904 when Ballistol was patented. It was issued to German troops from 1905-1945 and is still popular today. Most modern CLPs have a synthetic oil base which provides lubrication, a solvent in the form of an alcohol or an aromatic hydrocarbon, which breaks down carbon deposits, and various additives to provide long-term protection of the surface of the metal. The ratio of each part has an effect on that CLP’s efficacy. Enough solvent needs to be included to break down carbon deposits for cleaning, but no so much that it dissolves the oil base. That is why some CLPs are better at cleaning, while others are better at lubricating. Most civilian shooters do have time to do a full disassembly and cleaning, so the CLP question then becomes, what do I sacrifice by using a CLP type oil? 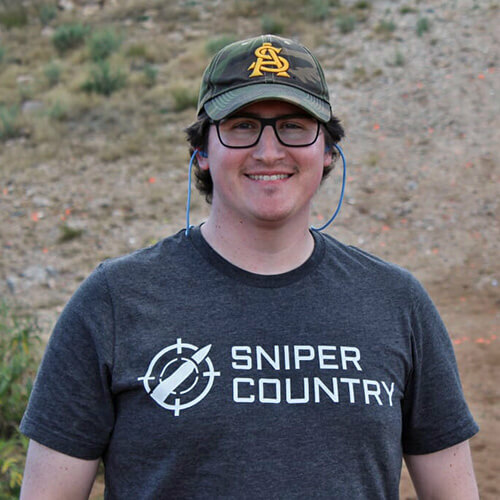 To try and control as many variables as possible, all the shooting was done with a NEW Ruger 556 MPR on the same day and with the same ammo. We didn’t want weather conditions like humidity and temperature to affect the results. We shot 1600 rounds in total, 200 for each lubricant. 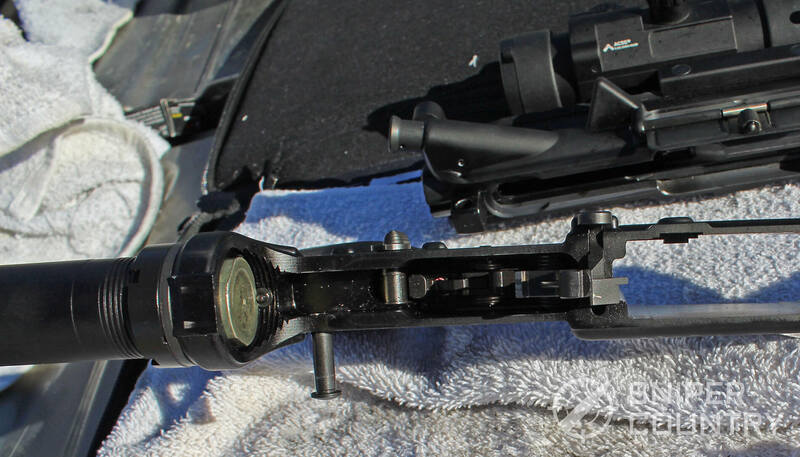 Between each test, we did a thorough cleaning of my AR-15 to prevent cross contamination. For the full review of each lubricant, read on. If you’d rather just see our findings, we’ve listed the best of each category under the final results section. Break Free was originally designed for and used by the US military. It isn’t currently their CLP of choice, but it is still the most common CLP type lubricant sold today. You may also see CLP-2, CLP-3 or CLP-4 when browsing, but those refer only to the method of application. The formula is the same for each version, aside from an added propellent in the aerosol. Using it to clean worked well, and it didn’t require much soak time or scrubbing to remove the powder and carbon deposits. They wiped off fairly easily. Of the three CLPs, Break Free was the best at cleaning, and required the least set time before quick carbon removal was possible. I use Otis’ B.O.N.E. tool to remove build up on the bolt, and with Break Free one turn was enough to get most of it off. Applying Break Free is an easy process, the oil is thin enough to reach tighter areas, but thick enough not to run everywhere. During the initial application at least. Left overnight, Break Free seemed to thin out slightly and it can pool in places you may not have originally intended. 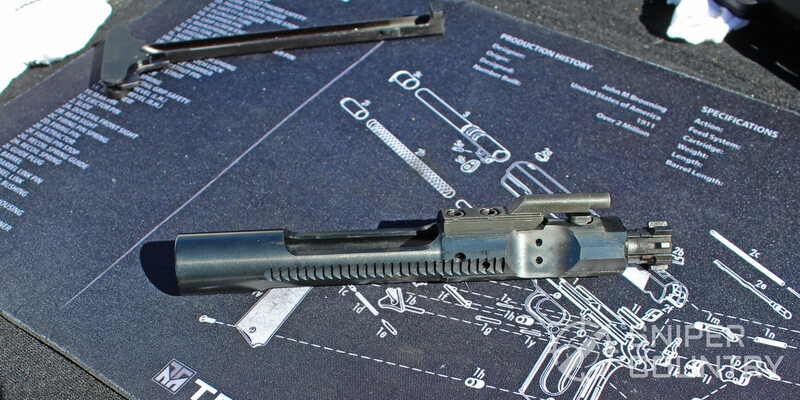 I store my guns muzzle up in my safe, and after only a light coating, much of the oil had made its way down to the top of the buffer tube by the following day. Enough was left on the desired surfaces that I wasn’t worried about needing to reapply it, but it was a little disappointing to see. What seems most likely is the solvent used for the ‘cleaning’ part of CLP breaks down the base synthetic oil slightly which makes it thinner, before the solvent fully evaporates. When left to sit on the gun, Break Free thinned out slightly but maintained a protective layer. Once all the oil dries up, it is supposed to leave a film behind. If the gun in question is going to be coated and then left alone and untouched, it makes an acceptable preservative. I wouldn’t rely on it for a gun that might be handled or moved though. 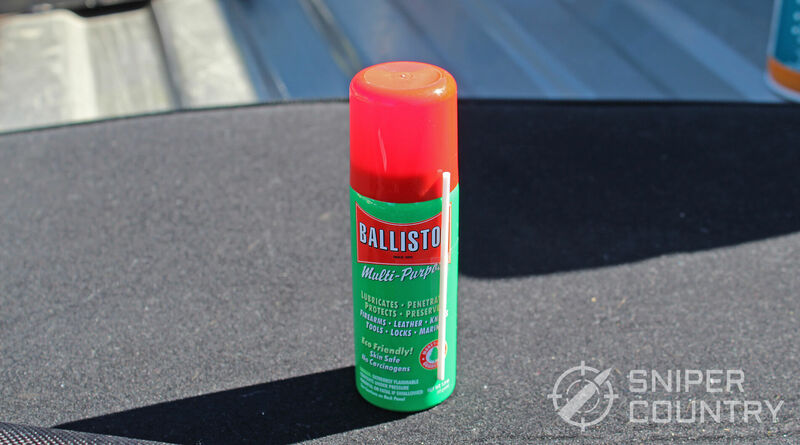 Ballistol and Otis’ Bio-CLP left a thicker film much earlier after applying. 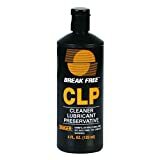 Of the three CLPs, Break Free was the best at cleaning, and required the least set time before easy carbon and powder residue removal was possible. The solvent it uses appears to be the strongest of the three, and since it’s not great for you skin or the environment, I’m not too surprised. As a lubricant and protectant, there are better options available. There’s something special about using a product your great grandpa used, and Ballistol is no exception. It proved its worth on both sides of the Western Front and can help protect wood and leather surfaces too. The smell of Ballistol is a bit polarizing to some people, so if you’re sensitive to smells it may be a bit strong. Especially when cleaning indoors. Outside it’s not as much of a problem, but indoors it can be a bit intense. As a cleaner, it doesn’t have the immediate breakdown power of Break Free. A saturating spray followed by a few minutes of soak time will help it eat away some of the buildup though, which you can see by the run off on the towel below. The solvents it uses are a mix of alcohols, rather than the harsher benzene-based solvent that is found in some CLPs. As a result, it takes a little longer for it to break down deposits and may require a little more scrubbing but is safer for you and any wood furniture attached to your gun. As a lubricant, it did leave a little to be desired. I gave the bolt assembly a quick spray and lightly wiped off the excess, leaving a thin film that I’d hoped was sufficient. After the 200 round disassembly, the action was nearly as dry as the desert I was shooting in. It’s possible it dried out more quickly than it normally would have, due to the arid climate. Using a thicker initial coating is a potential option but isn’t always ideal. 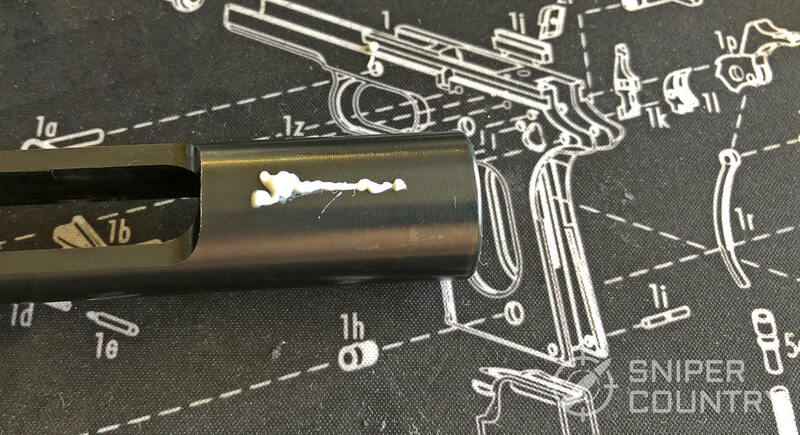 Too much lube can turn a gun into a dust magnet, and it can weep out onto your clothes. In more humid climates a thinner coat could likely be used, so this will be less of a problem. To test the protectant claim, I cleaned my pistol with it and let it sit for about a week. Upon inspection, most of the oil seemed to have evaporated, but it left a tacky residue behind that still coated everything I’d sprayed. For that reason, I would definitely trust it as a long-term storage protectant in both dry and humid environments. It also has the benefit of being non-carcinogenic, so skin contact won’t have any detrimental effects. A leather holster will be unaffected by it, as will any wood or polymer gun parts. This is a great non-toxic cleaner and an effective preservative. If you don’t mind running your gun on the wetter side, or if you live in a more humid climate, it is suitable as a lubricant too. 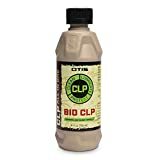 Otis’ Bio-CLP is a newer CLP offering, and coincides with the US military’s switch to a more eco-friendly CLP. I was curious as to what ‘Bio Based’ meant, so I took a look at the MSDS. A fair amount of it comes from plants, and the solvent is soy based. That doesn’t make it entirely skin safe, but it does have a lower toxicity than other cleaners. Bio-CLP did a good job removing powder residue and even after wiping the excess off, it left a slick finish on the metal. That finish should made subsequent cleanings easier. It didn’t work as quickly as Break Free when removing carbon build up, but it was a little faster than Ballistol. This is a shot I took before applying it, followed by a shot taken after letting it sit for a couple minutes. It lifts off the caked-on carbon in addition to breaking it down, which also puts it in between the other two CLPs. It starts out less viscous than Break Free and will run more than it on the initial application. You’ll most likely need to wipe up the excess, but it won’t thin out after you apply it. The slick semi-dry film that remains after a light wipe makes it a great lubricant for use in dirty and dusty conditions. 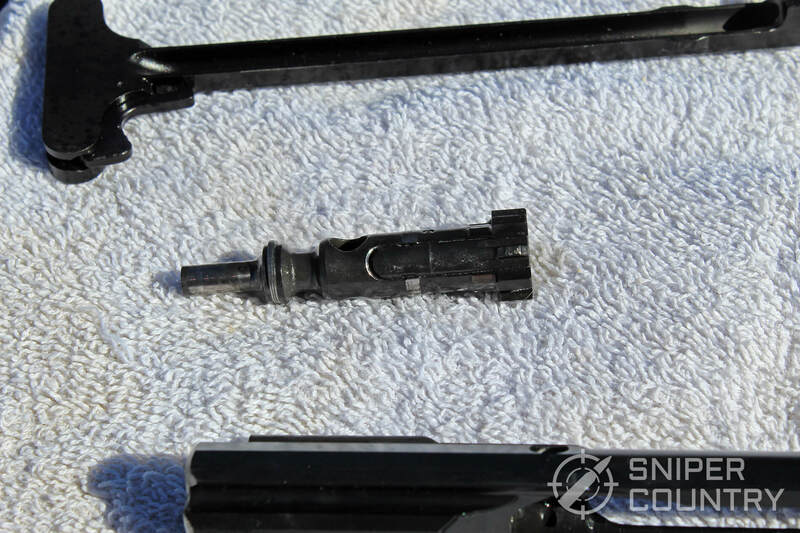 It maintained a sufficient boundary layer to prevent friction, and the bolt carrier didn’t end up covered in dust after the wind picked up a bit. It forms a protective barrier fairly quickly and is suitable for short and long-term storage. I would use a thin coating followed by a light wipe on a gun that would be used fairly often or would be holstered, and leave it without wiping on a gun that will be in safe or storage for a while. The semi-dry film it forms isn’t as thick and noticeably tacky as Ballistol, so in areas where the rust concern is more of a when, than an if, Ballistol might be a better choice. 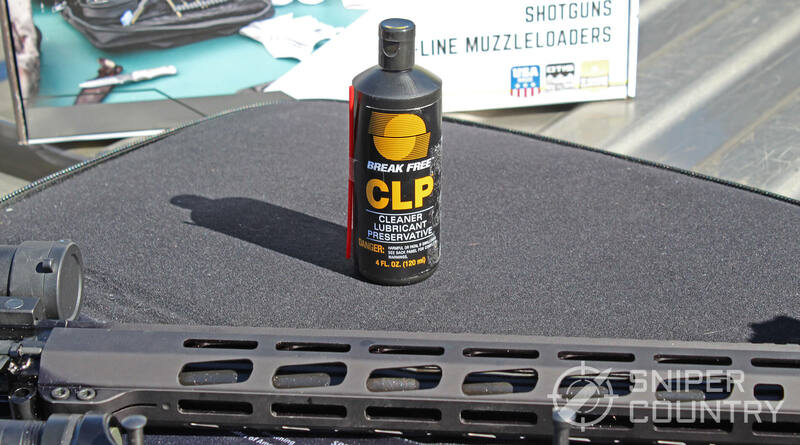 The speed at which it creates the semi-dry barrier is impressive, and for the average once a week to once a month shooter, it is the perfect CLP blend. 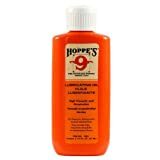 Hoppe’s is well known for its lubricants, bore cleaners, and distinctive smell. From a chemistry standpoint, Hoppe’s No. 9 Lubricating Oil is fairly simple. It consists almost entirely of mineral oil, with two secret sauce additives blended in. It does a good job of staying in place while being applied and a thin coat is enough to keep a component slick. The action was noticeably smooth when cycling with the charging handle. After being left on overnight, the oil hadn’t thinned or run off of the surfaces it had been applied to. 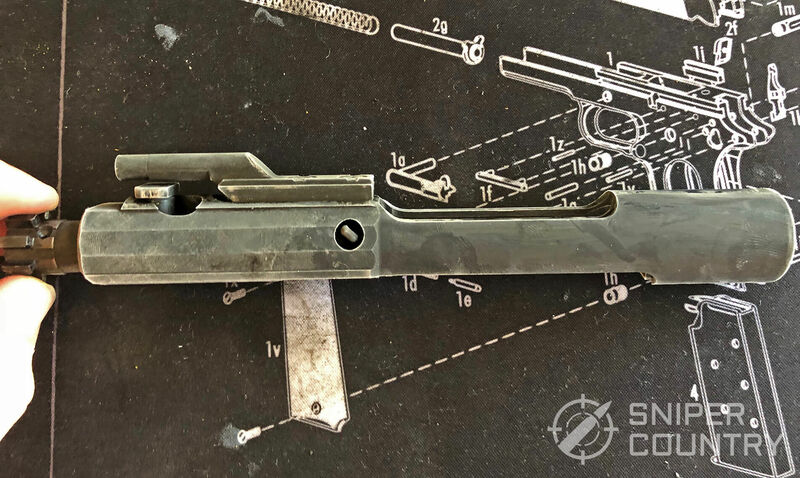 Following the post shooting tear down, the bolt carrier still felt slick, and there wasn’t much carbon build up sticking to it. Nearly all of it comes off after a quick wipe, so it doesn’t have longer lasting lubricating properties of some of the other options. It didn’t dry out or evaporate when left for an extended period of time and will work well as a protectant as long as the metal to be protected isn’t wiped off accidentally. Since it doesn’t leave a dry or tacky residue, wrapping a lightly oiled rag around the gun would be best for long-term storage. It’s a simple and effective lubricant that gets the job done but it doesn’t have the additional qualities of some other lubricants. It stays oily and has the potential to get gummed up by dust and carbon. 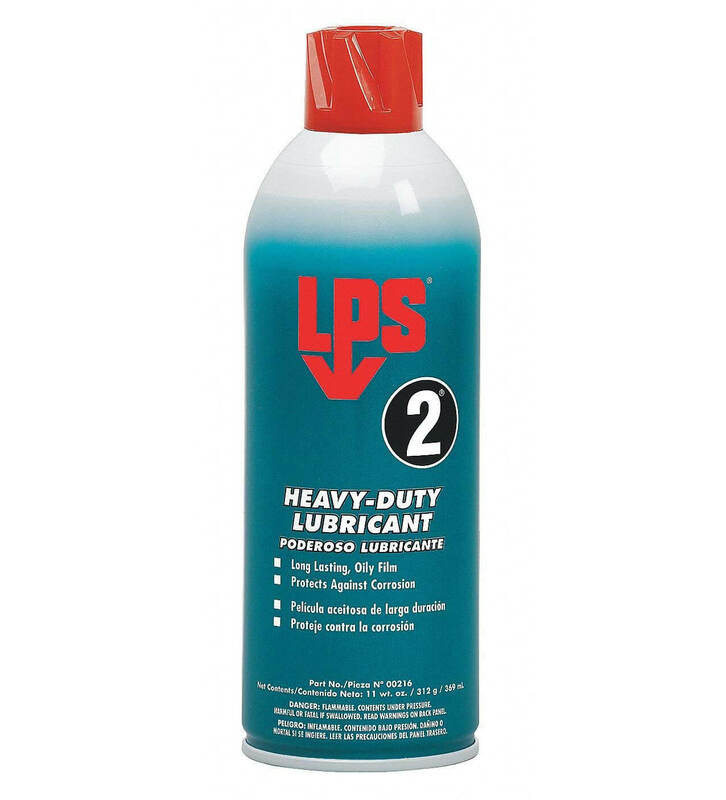 LPS-2 started life as an aircraft lubricant, and enough mechanics took it home for it to become a popular gun lubricant too. It can pull its own weight in the gun world and doesn’t include any chlorine compounds. It also comes in three flavors which offer varying degrees of lubrication and preservative qualities. LPS-2 is a balance between LPS-1, which is a lighter semi-dry lube, and LPS-3, which is a heavier protectant that is designed more as a rust preventer. It is safe for use on plastics and polymers. This lube makes no pretenses about being skin, environment or inhalation safe though, so apply in a well-ventilated area. This is a great lubricant for those in more humid climates. It leaves a strong boundary layer that adheres well to the metal, and last longer than most other lubricants. It does seem to attract more dust, but not so much that it gums up the action. The best way to apply it is by evenly spraying the part and wiping off the excess, rather than trying to spread it around. It is a runny at first, but after a few minutes it turns into a slick oily film. A thicker layer can be used without turning the gun into a drippy mess, but a thinner layer may be better for guns with tight tolerances. The post 200 round tear down showed the oily boundary layer still intact, and most of the carbon was easy to wipe off without needing a cleaner. The durable boundary layer it creates makes it a good choice as a protectant, especially in salt water environments. 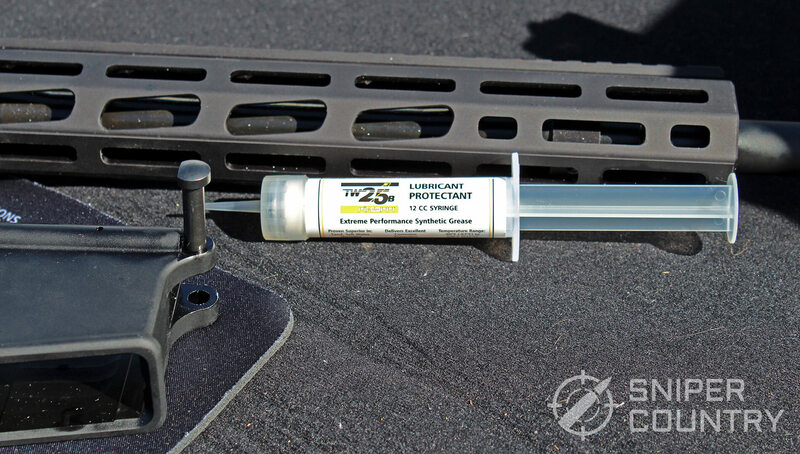 The next step up, LPS-3, is a dedicated rust protectant, but this is a good option if the gun needs to be usable and protected. It also won’t lose its lubricating properties over time, which makes it a great choice for a carry gun, but probably not a pocket carry gun. It attracts too much dust for that. To protect your gun from corrosion and rust while staying operation, this is the best lubricant on the list. Since it is on the toxic side, it’s best to use on the gun’s internals, unless it’s going into storage. 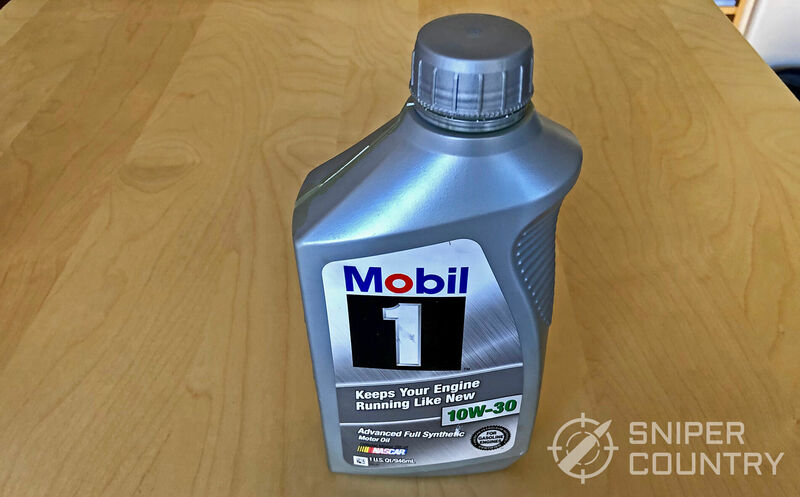 A fair number of shooters will swear by plain old motor oil, typically 10w-30. From a lubricant standpoint, it can handle a lot of heat and friction. It can also handle cold and hot weather equally well. The included additives can harm leather holsters though, so it’s something to keep in mind if you carry. The thickness of the oil is dependent on what viscosity you choose, I went with 10w-30 since it’s a popular choice. It’s not overly runny, but it doesn’t adhere to the metal very well. It’s designed to lift and collect contaminants, and then drip down for filtering and recirculation. That doesn’t happen in a gun, and so carbon and powder residue tends to clump up. 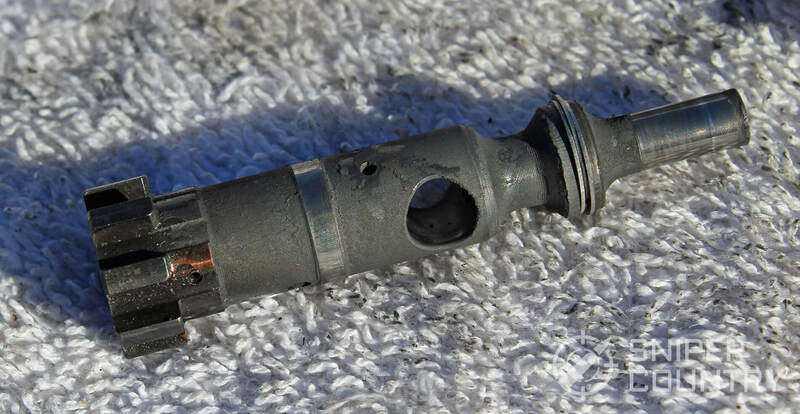 Of all the lubricants tested, motor oil had the most carbon build up on the bolt and bolt carrier. Much more than the greases, which was surprising to me. As long as a sufficient coating is left on the metal, it should work well as a protectant. It won’t leave a protecting film if wiped off, so it’s best for guns left alone. 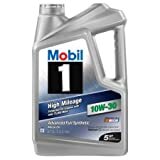 There are other options that can do a better job, but none that approach the monetary savings you get by using motor oil. If you don’t mind a little extra build up between cleanings, there’s no real harm in using it. 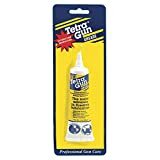 Tetra Gun Grease has a Teflon base, which makes it safe for rubbers, plastics and metals. It behaves the way you would expect a grease to behave. It is the thickest of all the substances we tested and is easy to spread without any concern of it running. Tetra has some specific instructions for proper use. It is important to knead the tube before applying, and to rub it into the metal. The line on the bolt carrier below was enough for the entire carrier and charging handle, so a little goes a long way. It has a slick yet tacky consistency and did a good job keeping things gliding smoothly despite the thin layer. It may still be a little too thick for super high tolerance parts, but it worked well on my AR-15. Dust and carbon build up wasn’t much of a problem and most of the grease and contaminants were easy to remove with a quick wipe down. The grease temperature test further down shows how it fares in freezing temperatures. For long term protection, following the direction to knead the tube is pretty important. Over time, unmixed spots could harden or lose their protective layer. There are also some claims that it has caused/allowed rust floating around, and I’ll bet those are due to it not being well mixed. 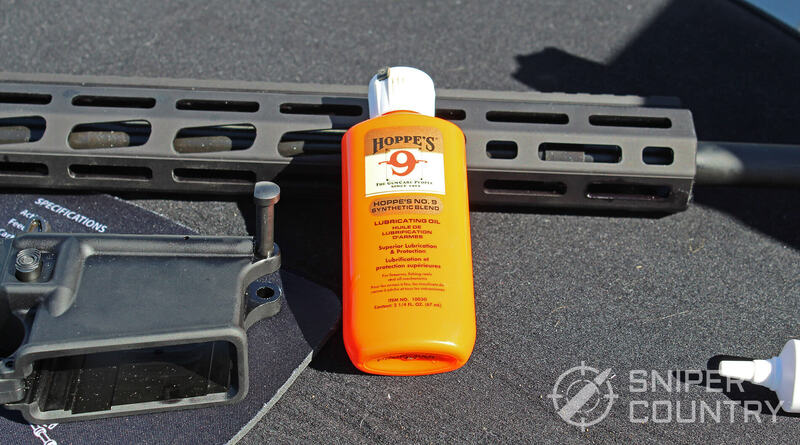 This is an effective lubricant and would work best on guns with parts that don’t fit too tightly together. Since it is a little thicker, it will maintain a good boundary layer for longer than most oils. It should be a good preservative as long as the mixing is thorough. TW25B is a light grease that is intended for use in a wide range of temperatures. It is popular with our military personnel overseas and wins major points for being non-toxic and eco-friendly. The grease is thin when first applied and is easier to spread for that reason, the consistency is closer to sunscreen than a typical grease. The small nozzle makes it easier to apply to tight areas, and not much needs to be used since it will spread well. The amount used above was enough for the bolt carrier group and charging handle. 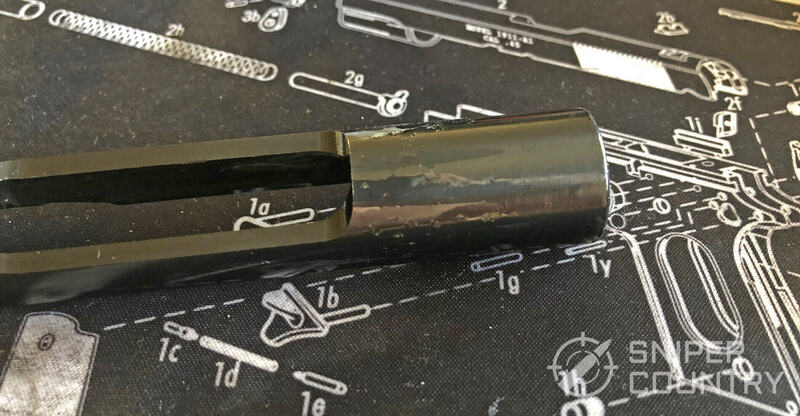 It’s also the perfect consistency for the trigger pack, I put a small dollop on the trigger coil spring and it worked its way down into the pin. 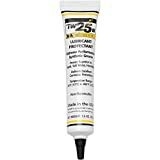 TW25B is a good protectant that will prevent rust and corrosion. It remains useable when cold and doesn’t need an overly thick coating applied. Since it won’t run and won’t harm your skin or a holster, it can be used in a carry gun without concern. It also lasts for a long time without drying out so there isn’t a need to reapply. USED BY U.S. SPECIAL FORCES WORLDWIDE: TW25B is uniquely engineered, made in America and is used by U.S. Special Forces. SUPER LUBRICATION and PROTECTION: Preferred lubricant on heavy weaponry, AR's, all firearms, shotguns and handguns while protecting wear parts and bore. If you don’t need your lubricant to have any cleaning power, and price isn’t your primary concern this is a good one to go with. It showed no evidence of hardening during the freezer test (shown below) and can survive high temperatures. It didn’t attract much dust and carbon buildup was minimal. 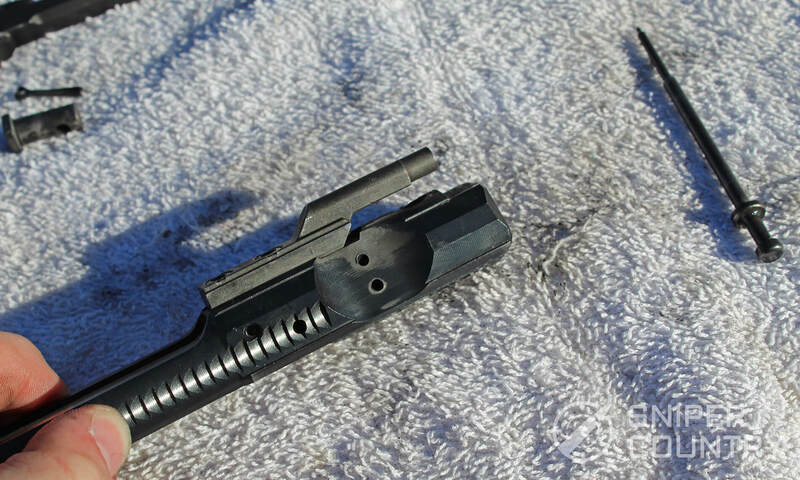 To give the greases a temperature test, I coated one side of my bolt carrier with Tetra and the other side with TW25B. Then I put it in my freezer. The side shown above was coated with Tetra. This was actually the result of the second freezer test I had to perform, since I didn’t knead the Tetra well enough the first time. Initially it ended up waxy in some spots and slick in others. I let it return to room temperature, cleaned it off and did it again. Kneading it led to a more uniform coating, but it was still firmer that it had been at room temperature. That was enough for me to know that if I ever move to a place where white frozen flakes of water fall from the sky, I probably won’t be using Tetra. The side shown below was coated in TW25B. It turned white in spots where I’d left it on a little thick, but it had no effect on the grease’s viscosity. You can see by the fingerprint that my post-freeze thickness test smudged the grease right off. Freezing it had no negative effect on its slickness, thickness or lubricating ability. It’s definitely a better choice for cold weather. 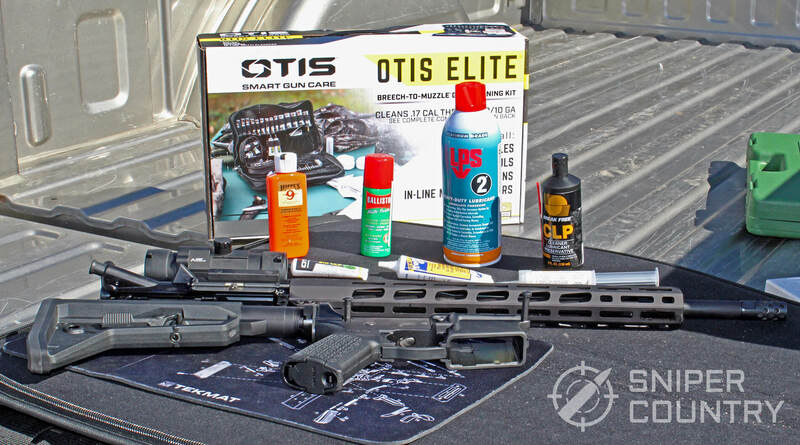 Otis Bio-CLP strikes the best balance of cleaning, lubricating and protecting. It won’t thin out after being applied and it doesn’t have a problem operating in dry or humid conditions. 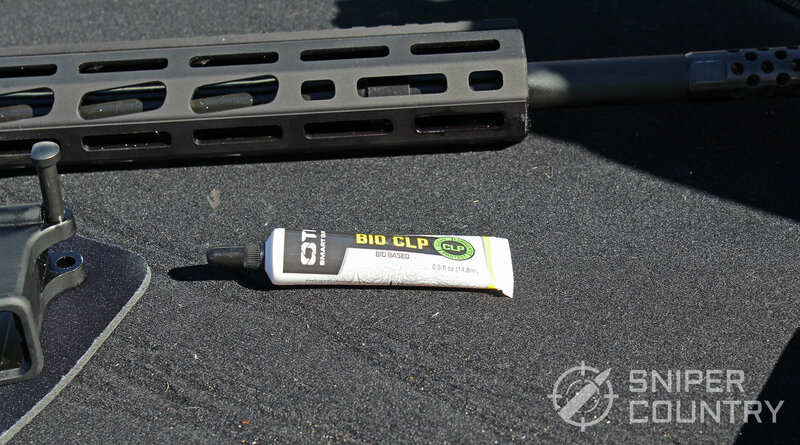 It isn’t the ultimate lubricant or protectant of all the products we tested, but that’s not what a CLP is all about. It’s an efficient and effective gun oil that can also fit in your range bag. LPS-2 is the clear victor in this category. Its properties make it work well as a lubricant and preservative. It doesn’t clump up carbon and powder residue like regular motor oil, and it leaves a thin but lasting film even after its mostly wiped off. Hoppe’s doesn’t clump up, but it’s easy to accidentally wipe off. LPS-2 It isn’t very eco or human friendly, but neither are the other two. This one was a hard call to make. Tetra isn’t as good at TW25B in cold weather, but TW25B is significantly more expensive. The price is hard to justify unless you live or often operate your gun in freezing temperatures. For most other climates, like the desert, forest, and oceanic areas, Tetra doesn’t really lag behind. What lubricant do you use and how does it work for you? Let us know in the comments! Good article but maybe next time you should include Slip 2000. I have used their products for years and will use nothing else. They cover all the CLP tests very well. 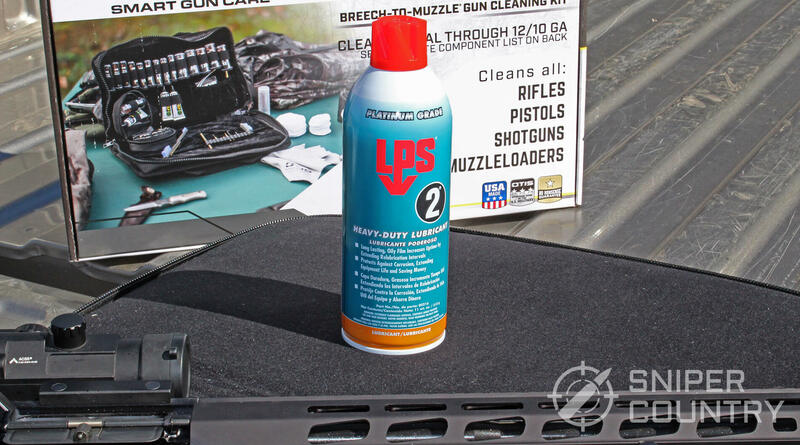 Sig Sauer just branded their own lube & cleaners, made by the people at Slip 2000. Check it out. Have you done or thought about doing a dry lube test? Not yet, but we might add that soon. Thanks a lot for the feedback, we appreciate it!